Hey Friends. 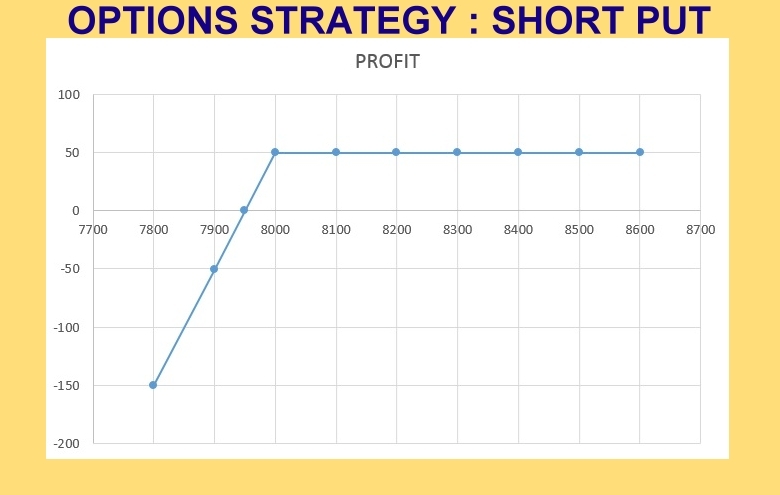 So today finally we will discuss “Short Put Strategy” – last of the simplest options strategies. Tomorrow onwards we will start with more advanced and complex, but more interesting strategies. We can use a Short Put Strategy when we are bullish in the market or a particular type of underlying and we expect the prices to rise. In this strategy we sell the Put in the assumption that the underlying will move in an upward direction. This position offers limited profit potential and the possibility of unlimited losses in case the rates of the underlying fall significantly. 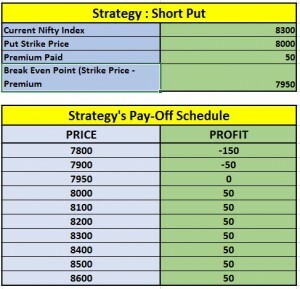 Though the strategy is very simple and easy to understand, execute and profitable, please remember that this strategy has unlimited risk compared to very limited profits. We can use this strategy when we are bullish about a particular stock or index. The reason for using this strategy is that there is a high probability for success when selling very out-of-the-money Put Options. NIFTY is currently trading around 8300. Let’s assume you are extremely bullish on NIFTY. So you sell one lot of current month Put with 8000 strike price at a premium of Rs. 50. If the Nifty remains above 8000, the put option will not be exercised by you and you will be able to retain the premium or Rs. 50 x The Lot Size. In case the Nifty falls below 8000, you may incur an unlimited loss. We use this strategy when we highly expect a rise in the price of the underlying. But this is a risky strategy as our profits are extremely limited (Rs. 50 in this case) but the losses are unlimited as we tend to lose a lot of money if the underlying index or stock keeps falling down. Therefore this strategy should either be used when we are certain that the prices of underlying will go up or with a stop loss.